Heidi Malnar is an Emmy and three-time Big Easy Award winning dancer and choreographer from Chicago. 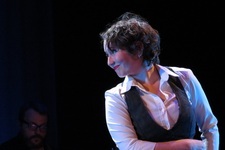 She is the Artistic Director of Gulf Coast Theatre on Tap- New Orleans' premier jazz and rhythm tap company. She most recently choreographed "42nd Street," "13," “Spamalot,” and choreographed & starred in “Rapunzel,” directed by Ricky Graham. She received her Bachelor of Arts in Dance from Columbia College Chicago. Heidi is a former company member, of the Chicago-based Jump Rhythm Jazz Project, directed by Billy Siegenfeld, where she received an Emmy Award for “Outstanding Achievement for Individual Excellence on Camera: Performer” for her work in the multiple Emmy Award winning documentary Jump Rhythm Jazz Project: Getting There, produced by HMS Media and aired on PBS. She also performed with the edgy, experimental Chicago Tap Theatre, directed by Mark Yonally. Before moving to New Orleans, Heidi enjoyed her faculty position at Carthage College where her choreography for “Thoroughly Modern Millie,” received a Kennedy Center American College Theatre Festival Certificate of Merit for her work. Since coming to New Orleans only two years ago, she has become fully invested in dance education and choreography at Tulane University, Encore Studio of Dance, Tumbling, Music & Theatre, New Orleans Ballet Association, St. Martin’s Episcopal School, and Rivertown Theaters for the Performing Arts. Other recent choreographic projects include: “Legally Blonde the Musical,” “The Class of 70-Something,” “Freckleface Strawberry,” “Thoroughly Modern Millie, Jr.,” “Pippin,” “Grease, School Edition,” "Spamalot," and "42nd Street." Laura Sicignano, Associate Artistic Director of Gulf Coast Theatre on Tap, began dancing at the age of 13 where she joined the apprentice company at the Houston Metropolitan Dance Center. She really began her tap dance training 3 years later with Alfred Lowe. She went on to dance for his company while she was still living in Houston. Laura attended the University of New Mexico where she danced for the Bill Evans Rhythm Ensemble for 4 years. After college she continued her training with Acia Gray and Jason Janas of Tapestry Dance Company in Austin, Texas. Laura then moved to Chicago where she began dancing for Chicago Tap Theater under Mark Yonally. She also danced with the Cartier Collective for a year. While in Chicago, Laura enjoyed dancing with a swing band called the Sons of Susan. Laura is a recent transplant to New Orleans..
Sarah Broekhoven is currently a student at Louisiana State University. She is also a member of the Honors College and is studying Nutritional Sciences. Sarah has been a dancer for 18 years and danced competitively for 14 years. She began dancing at Darni Fenerty's Dance Factory when she was one and a half. She stayed there for 6 years before moving to Debbie’s Dance Academy. She stayed at Debbie’s Dance Academy until it closed in 2005. After 6 years at Debbie’s, she moved to Dancer’s Pointe from which she graduated. She began soloing at the age of 4 and soon began specializing in tap. Sarah has attended numerous conventions with renowned tappers including Nuvo’s Masterclasses with Anthony Morigerato, Jump Masterclasses with Mike Minery, and NTG Conventions. She has received numerous convention scholarships and was an NTG POW! Title Winner. Sarah received her teaching certificate from Dancer’s Pointe after teaching multiple tap classes. A highlight of Sarah’s career thus far was dancing back-up for Beyonce’ at Super bowl XLVII’s halftime performance in 2013. Most recently, Sarah danced in Rivertown Theater’s production of 42nd street. She is currently taking classes at Revolution Dance Company in Baton Rouge and a Professional member of Gulf Coast Theatre on Tap. special thanks to Kathy Reiss and also to Heidi for giving me this awesome experience. Susan Grady is delighted to return to the stage with Gulf Coast Theatre on Tap! A native of Pittsburgh, PA, and proud holder of a B.F.A. in Musical Theatre from The University of Michigan – GO BLUE! Susan previously performed around the world; now teaching is her passion, both dance and Oneness/deeksha. She was seen in42ND STREET on the Asia Tour and in Moscow, Russia, in THE SOUND OF MUSIC Asia Tour, as well as the U.S. National Tours of SATURDAY NIGHT FEVER and ANNIE GET YOUR GUN. Regional work includes Roxie Hart in CHICAGO, Judy Haynes in WHITE CHRISTMAS, Leading Player in PIPPIN, Audrey in LITTLE SHOP OF HORRORS, and Goodspeed Opera House production of HIGH BUTTON SHOES. Favorite role played was the Countess/Bolero Dancer in GRAND HOTEL. Susan has choreographed for the Victory Belles at the National WWII Museum, as well as many musicals across the Midwest and Northeast. This performance is dedicated lovingly and gratefully to my mom, dad and Elton, for giving me a reason to dance. Elizabeth Shortall Pulsinelli was born with the desire to tap. She began tapping at the age of three, and has never looked back. Elizabeth grew up in Dallas, TX and was trained by professional dancer and choreographer Jackie Troup Miller. This legendary woman, who partnered most often with Donald O'Connor at Universal Studios, is Elizabeth's daily inspiration and unforgettable tap role model. Elizabeth further expanded her training and studied with Terry Wolter, and was inspired by the contemporary and freeing feel of rhythm tap and improvisation. She then moved to Austin and continued her tap training at Tapestry under the direction of Acia Gray. She hold's a B.A. from Saint Edward's University in Theatre with an emphasis on Performance and Arts Administration. Elizabeth has taught tap to younger generations, and has also stage managed and performed in the southern region of the country. Recent credits include Chicago, Spamalot, and 42nd Street. Elizabeth currently lives in New Orleans with her food loving husband, Todd and happy son, Hank. Tapping in the kitchen is a daily part of family life, and she continues to learn and be inspired every day by Heidi and the members of Gulf Coast Theatre on Tap.